Posted by Null in Cross Culture, Movies. I have just watched this film from 80s of Hollywood. 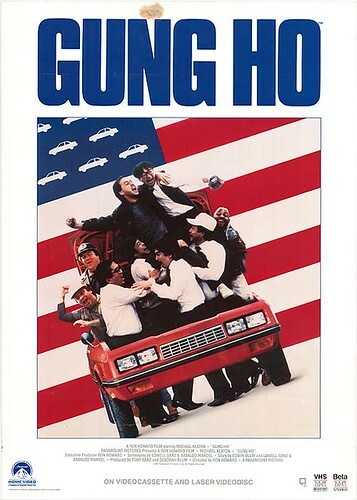 The movie, Gung Ho (1986) played by Michael Keaton is a comical yet a learning film that illustrates the cross-cultural differences between American and Japanese management. The film portrays problems in managing operations in a different country if the culture is vastly different from the one you usually work. In Japan, they follow a ZERO defect formula (Theory Z) of operations management where every single product manufactured should be defect free. In reality it may look impossible by many but the Japanese management in major organizations has been following this strategy and they had been successful, whereas, organizations of other nations may not be able to achieve such an operations policy. In Japan, they also believe in collectively achieving together. In fact, Gung Ho literally means “working together”. This not only signifies the collective work but also the degree of devotion of a worker towards his/her organization. If an employee is not being productive like a machine, it is a shame for the employee. However, work and life is different in another part of the world which is called America. The film starts with the acquisition of an American automobile plant by a Japanese automobile company named Assan Motors. Most importantly, the movie depicts that if cultures are significantly different, you may not be successful if you are not tolerant and compromising regardless of how good you are as a manager. Since cultures are different, so as the individual characteristics. Therefore we should try bending or tailoring or even adjusting our management techniques in order to conform according to the local culture where we are doing our business.